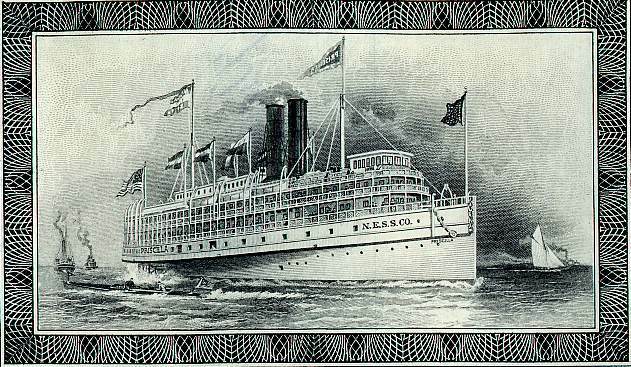 Beautiful certificate from the New England Steamship Company issued in 1913. 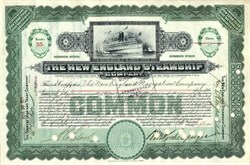 This historic document was printed by the American Banknote Company and has an ornate border around it with a vignette of the Steamship Pricillia. This item has the signatures of the Company’s President and Secretary, and is over 101 years old. This is the first time we have had this certifcate for sale. The Fall River Line steamers docked at piers on the North River in New York City. The boats left in the evenings, easing out into the East River, then heading east on Long Island Sound to Newport. The boats arrived in the early morning hours in Fall River. Passengers disembarked from the steamers there and boarded the Old Colony Railroad trains. They arrived in Boston in time for their morning appointments. On Sunday evenings, passengers left Boston for New York from the Old Colony Railroad Depot. They boarded the steamers in Fall River and traveled to Newport, then continued on the overnight trip back to New York. As overnight vessels, the Fall River Line steamers offered staterooms, dorm berths, and salon chairs for their guests. 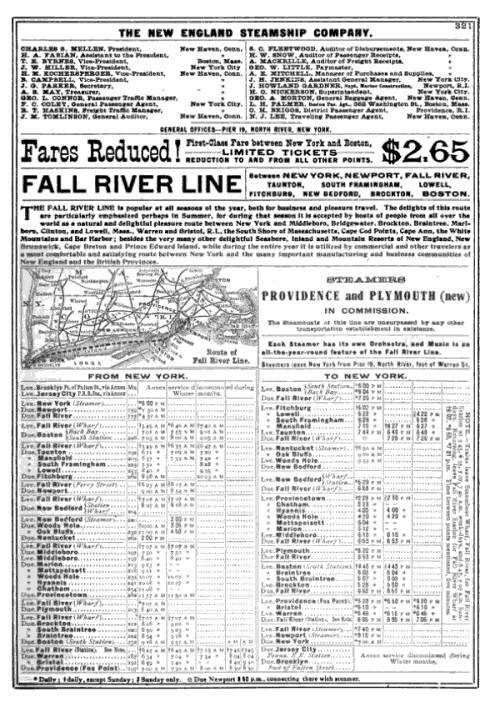 A September 20, 1881, advertisement from the Fall River Daily Evening News listed prices for first-class tickets at $3, and for second-class tickets at $2.25. Room prices for the full route ranged from $1 to $5 per person. The Fall River Line steamships' gilded interiors appealed not only to the wealthy clientele who rode the ships, but to middle-class passengers as well. The ships gave people of other classes the actual experience of spending a night within the architectural splendor of wealth. The Fall River Line was popular during all seasons of the year, both lor business and pleasure travel. The company carried passengers between New York and Middleboro, Bridgewater. Brockton, Braintree, Marlboro, Clinton, and Lowell, Mass., Warren and Bristol, R.I,, the South Shore of Massachusetts, Cape Cod Points, Cape Ann, the White Mountains and Bar Harbor ; besides the very many other delightful Seashore, Inland and Mountain Resorts of New England, New Brunswick, Cape Breton and Prince Edward Island. The Fall River Line, transported many wealthy customers including the Astors, Vanderbilts, and the elite of the Eastern Establishment between New York City, Boston, and their palatial summer 'cottages' at Newport, Rhode Island.